Athabasca University in Canada and Chair of Internet Technology at Brandenburg University of Technology at Cottbus in Germany. In this use case, we present rules interchange between the Semantic Web Rule Language along with the Web Ontology Language (SWRL/OWL) and the Object Constraint Language along with the UML (UML/OCL). The solution is based on the REWERSE I1 Rule Markup Language (R2ML), a MOF-defined general rule language, as a pivotal metamodel and the bidirectional transformations between SWRL/OWL and R2ML and between OCL/UML and R2ML. We use the Rule Definition Metamodel (RDM) as metamodel for the SWRL language, that is based on the Ontology Definition Metamodel (ODM). OCL is a language that enables one to describe expressions and constraints on object-oriented (UML and MOF) models and other object modeling artifacts. An expression is an indication or specification of a value. A constraint is a restriction on one or more values of (part of) an object-oriented model or system. 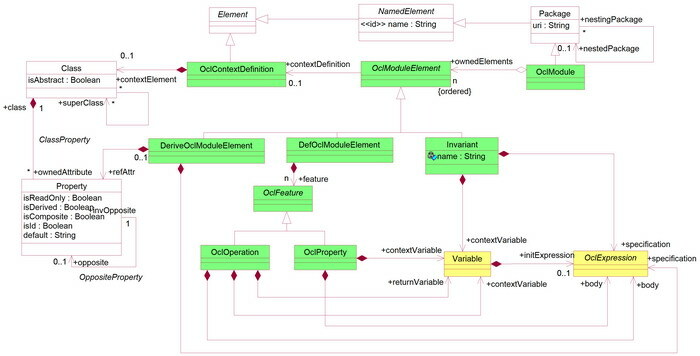 The OCL metamodel inerhits the UML metamodel. The UML is the most used and known language to model application structure, behaviour and architecture but also business process and data structure. Since the standard specification of the OCL metamodel  does not contains support for OCL invariants, in our research, we introduced the EnhancedOCL package is defined in order to fill this gap. This package contains the Invariant class, as a subclass of the OclModuleElement class (see Figure 1). OclModuleElement represents a superclass for: OCL invariant elements (the Invariant class); OCL operations and properties, i.e., “def” elements (the abstract class OclFeature) that are represented with classes OclOperation and OclProperty, respectively; and OCL derivation rules, i.e., "derive" elements (DeriveOclModuleElement). OclModuleElement contains a definition of an invariant context that is represented with the OclContextDefinition class. SWRL is a web rule language based on combination of the OWL DL and OWL Lite sublanguages of the OWL Web Ontology Language, with the Unary/Binary Datalog RuleML sublanguages of the Rule Markup Language (RuleML). SWRL is based on classical first order logic and its rules are of the form of an implication between an antecedent (body) and a consequent (head). The intended meaning can be read as "whenever the conditions specified in the antecedent hold, then the conditions specified in the consequent must also hold". Both the antecedent (body) and consequent (head) consist of zero or more atoms. Multiple atoms are connected with the conjuction operator. Rule Definition Metamodel (RDM) is a MOF-based meta-model for SWRL, and it is based on  (see Figure 2). Implemented solution of transforming OCL invariants into the SWRL rules via R2ML rules consists of five transformation steps. The first one (see Figure 4) is between OCL rules (invariants) represented in the OCL concrete syntax (in the EBNF technical space) and models compliant with the OCL metamodel (in the MOF technical space). This is done by using the EBNF injection (ATL feature) of OCL rules, that is, by instantiating the MOF-based OCL metamodel (i.e., creating OCL models) and by using the OCL parser we created. Second, the MOF-based OCL rules obtained (OCL models) are transformed to R2ML models compliant with the R2ML metamodel. In the third step, R2ML models are transformed into the RDM models (i.e., instances of the SWRL metamodel) by using R2ML2RDM.atl transformation. In the fourth step, RDM models are transformed into the XML models (i.e., instances of the XML metamodel) by using transformations RDM2XML.atl transformation. 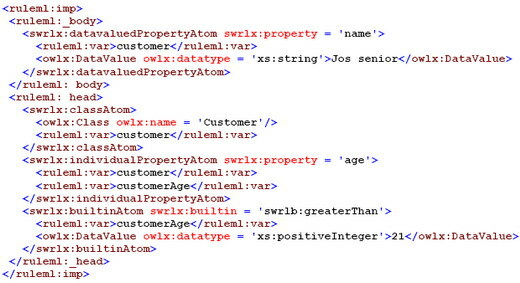 Five, such XML models (from the MOF technical space) are serialized into the SWRL XML format (complaint with the SWRL XML Schema) by using the ATL XML Extractor tool. All of these transformations are based on the conceptual mappings that we have defined. In addition, we have also defined transformations in opposite direction, so it is possible to translate SWRL rules into the OCL invariants via R2ML (remark: this side have ceratin constraints). A UML model which contains a UML class (Customer) and has an OCL invariant defined on that class: if customer name is 'Jos senior' implies that is age is more than 21. is given in Figure 5. to serve as a running example for this use case. We first inject OCL code from Figure 5. into the OCL model by using the EBNF injector, (see Figure 4: EBNF injection), a part of the ATL toolkit, and the OCL Lexer and Parser. We generated the OCL Parser and Lexer by using the TCS (Textual Concrete Syntax), i.e., by defining TCS for the OCL. When we got an OCL model we then transform OCL metamodel elements into the R2ML metamodel elements (by using OCL2R2ML.atl transformations from Figure 4). As a result we get the R2ML model that can be serialized into the R2ML XML format (see Figure 6.). More details about this serialization process you can find in . In the next step we transform attained R2ML model into the RDM model (instance of SWRL metamodel) by using R2ML2RDM.atl transformation from Figure 4. Such RDM model can be serialized in the SWRL XML concrete syntax. 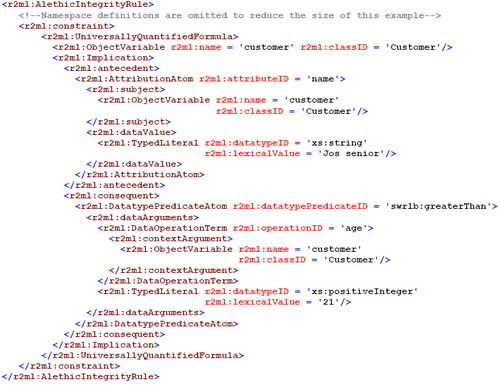 In order to serialize the RDM model (from the MOF technical space) into the SWRL XML concrete syntax (i.e., to the XML technical space), we first need to use the RDM2XML.atl transformation (see Figure 4) to get an XML model from RDM model. When we got a XML model which conforms to the MOF-based XML metamodel we can extract such model extraction from the MOF technical space to the XML technical space (XML extraction in Figure 4.) by using the XML extractor. A result of this transformations process for the RDM model attained in previous step is a SWRL rule in the SWRL XML concrete syntax (see Figure 7). This use case demonstrates how the AMMA tools can be used to share rules between different rule languages whose concrete syntaxes are defined in different technical spaces (i.e., in the XML, MOF and EBNF technical spaces). This ATL scenario provides a solution for bridging SWRL/OWL and OCL/UML is based on the pivotal (R2ML) metamodel that addresses the complexity of mappings between two rule languages, which contain many diverse concepts. More details about this scenario you can find in . Object Constraint Language (OCL), OMG Specification, Version 2.0, formal/06-05-01, 2006. 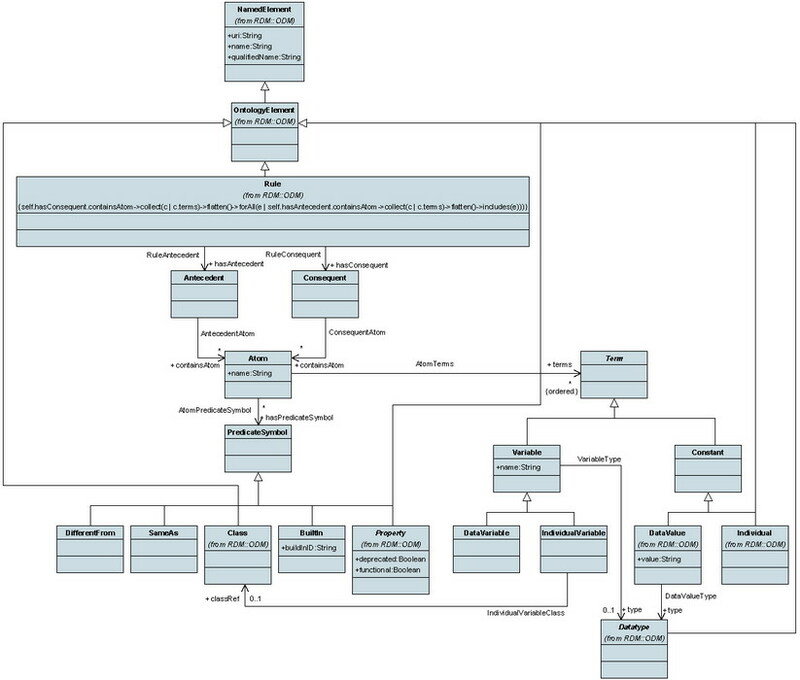 Brockmans, S., Haase, P., "A Metamodel and UML Profile for Rule-extended OWL DL Ontologies - A Complete Reference", Universit�t Karlsruhe (TH) - Technical Report, 2006. R2ML (REWERSE I1 Rule Markup Language) metamodel in MOF/UML format. Milanovic, M., Ga�evic, D., Giurca, A., Wagner, G., Lukichev, S., Deved�ic, V., "Bridging Concrete and Abstract Syntax of Web Rule Languages", The First International Conference on Web Reasoning and Rule Systems (RR2007), Innsbruck, Austria, 2007. Milanovic, M., Ga�evic, D., Giurca, A., Wagner, G., Deved�ic, V., "Towards Sharing Rules Between OWL/SWRL and UML/OCL", Electronic Communications of the European Association of Software Science and Technology, Volume 5, 2006. Scenario available in the ATL transformation zoo (with source files). R2ML metamodel is expressed in the KM3 textual format. The present work is being done in collaborative work with REWERSE I1 and LORNET Theme 1 projects.